Chutneys are a very basic side dish for many of our Indian snacks, tiffen. Vegetarian or Non-vegetarian, chutneys do with them well. 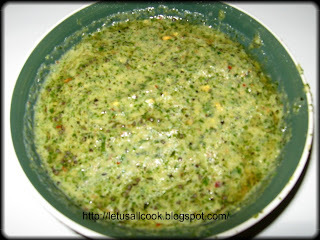 Here I have a recipe of Mint chutney. Personally, I love Mint a lot and they do have medicinal value. In a Pan, add oil and then cumin seeds. After few seconds. Add onion and saute them. Add red chillies,garlic and fry then for 1 minute. Now add the mint leaves and fry them. Let it cool. Add to the blender this mixture, salt and blend it by adding little water. In a pan, add oil and mustard seeds. When the seeds pops, add hing powder , urad dal,channa dal and fry for few seconds. Add this to the blended mixture and serve hot. yes zlamuksha, I have enterd in stickydate!